CBP has run out of space to process asylum seekers. Hundreds of migrants are being kept under the Paso Del Norte International Bridge in El Paso. Photo Credit: Mark Lambie for El Paso Times. In an immersive multimedia story with video and animation, The Washington Post brings to life how many immigrants are already living with invisible walls — barriers that prevent them from remaining in the U.S., being with their children, or living a life free of fear. Zoeann Murphy, Jon Gerberg, Jorge Ribas and Jesse Mesner-Hage take the viewer along on the journeys of three women — Elsa from Guatemala, Karla from Honduras and Yolanda from Mexico — who face these invisible walls. On Tuesday, the House failed to gain the 288 votes required to halt Trump’s national security declaration by overriding a presidential veto, meaning that courts will now determine whether the declaration is legal and how much money can be diverted to pay for a border wall, reports The Washington Post. As the government’s plan to build a border wall moves forward, landowners are increasingly vulnerable given that Homeland Security often waives protections meant to ensure they get a fair price for their land, reports ProPublica. An investigation found that property owners who are able to pay for a lawyer have received three times the average amount for their land. CBP predicts it could apprehend more than 100,000 border crossers this month, the most in the past decade, reports The Washington Post. This is still a much lower number than the historic high of more than 220,000 migrants apprehended in March 2000. During the early 2000s, most migrants crossing the border were single males from Mexico who could be quickly deported. Now, tens of thousands of Central American asylum seekers cross the border, requiring more detention space, immigration judges and other resources while their cases are processed. Meanwhile, DHS Secretary Kirstjen Nielsen signed an agreement in Honduras Wednesday to increase cooperation between law enforcement in the U.S. and the Northern Triangle and address root causes of migration. Politico reports that there are already hundreds of millions of dollars approved in aid to Central America, but the government does not know what to do with it because of conflicting messages from the White House. The El Paso and Rio Grande Valley sectors have seen the biggest increase in asylum claims in the past few months. “CBP is facing an unprecedented humanitarian and border security crisis all along our Southwest Border — and nowhere has that crisis manifested more acutely than here in El Paso,” U.S. Customs and Border Protection Commissioner Kevin K. McAleenan said on a visit where he said the system was at a “breaking point.” Border Patrol facilities, particularly in the El Paso border region, are more than 400 percent over capacityas the agency, reports CNN. In New Mexico, officials are experimenting with potential solutions to address the increase in asylum seekers, ranging from an app to help authorities communicate to increasing volunteer medical aid, reports the Albuquerque Journal in a four-part series about the border. Asylum claims from Cubans have also increased significantly in recent years. In 2018 the government processed 455 requests, this came after the Obama administration ended the wet-foot, dry-foot policy that allowed Cubans a special path to residency, up from 59 cases decided in 2016 reports NBC News. Cubans are also among a group of an estimated 2,500 migrants traveling in a migrant caravan through southern Mexico and activists say the group’s path has been hindered by the Mexican government, reports AP. ICE is arresting fewer immigrants in the interior of the country as the agency moves resources to the border, reports CNN. Arrests decreased 12 percent from last year, while more agents were directed to the “explosion at the border,” said Nathalie Asher, ICE acting executive associate director for enforcement and removal operations. ICE’s acting director said Tuesday that the agency has trained 1,500 state and local officers to help carry out immigration enforcement, reports Newsweek. The announcement comes as many other law enforcement agencies around the country are adopting sanctuary policies to separate their work from immigration enforcement. Under the Trump administration, ICE press releases are used to promote the agency’s goals of increased enforcement and criminalization of immigrants and they depict ICE as a looming threat to undocumented immigrants, according to an analysis by Topic Magazine of more than 3,400 press releases between 2014 and 2018. Under the Obama administration, press releases emphasized the efficiency of the agency. In October, ICE stopped ensuring that migrants had a way to travel to their destination before releasing them, a decision that has led to chaos as 107,000 parents and children have been released in California, Texas and Arizona in the past three months, reports PRI’s The World. An underground network of church leaders, charity organizations and volunteers has formed to house these migrants, with some volunteers hosting up to 40 migrants in their home at once. Univision’s Real America with Jorge Ramos follows a rapid response network in San Diegowhere people have been dropped off with ankle bracelets at McDonald’s parking lots. A Honduran mother recently gave birth to a stillborn baby in U.S. custody, raising questions about how immigration policy affects reproductive rights, reports The Washington Post. In an opinion piece, Sonia Gomez provides a history of nativist movements which have restricted reproductive rights of migrants. The “Remain in Mexico” program received new criticism for violating migrants’ rights. Documents obtained by the San Diego Union-Tribune revealed that migrants who express fear of returning to Mexico have not received a required interview with an asylum agent from USCIS. Since the program only applies to asylum seekers who turned themselves in at ports of entry, more migrants are crossing the border illegally near Tijuana to request asylum and avoid being sent back to Mexico, reports the San Diego Union-Tribune. Migrants rushed the border at least four times last week. Despite the controversy, “Remain in Mexico’ expanded to El Paso last week. Mexican officials in Ciudad Juarez are now struggling to adapt to the increase of asylum seekers staying long-term in the city without extra resources from the Mexican government to handle the problem, reports PRI’s The World. A flight attendant with DACA status who was detained for a month after a flight to Mexico, was released last week after an outpouring of social media support, reports the Houston Chronicle. Her employer said it was safe for her to travel but the case casts a spotlight on the misunderstandings about the program and its limits. New York City has seen a 14 percent drop in applications for U visas, which allow undocumented immigrants who cooperate with law enforcement to apply for legal status, reports WNYC. Immigration lawyers and activists attribute the drop to fear among undocumented immigrants of coming forward about crimes because of Trump administration’s restrictive immigration policies. Bilingual employees hired to translate and attend to immigrant youth at the Philadelphia offices of VisionQuest, a program for youth, reported being scolded for speaking Spanish in the office, reports The Philadelphia Inquirer. The incident is one of many which have grown more common in the U.S. in recent years. 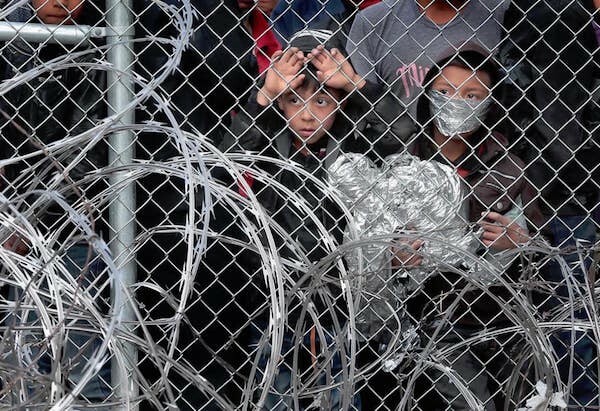 The Center for Comparative Immigration Studies published a report documenting violations of migrants civil and human rights, including family separation and the hardening of interior enforcement policies.